It's the holiday season and I am super excited to share some festive looks for the season! 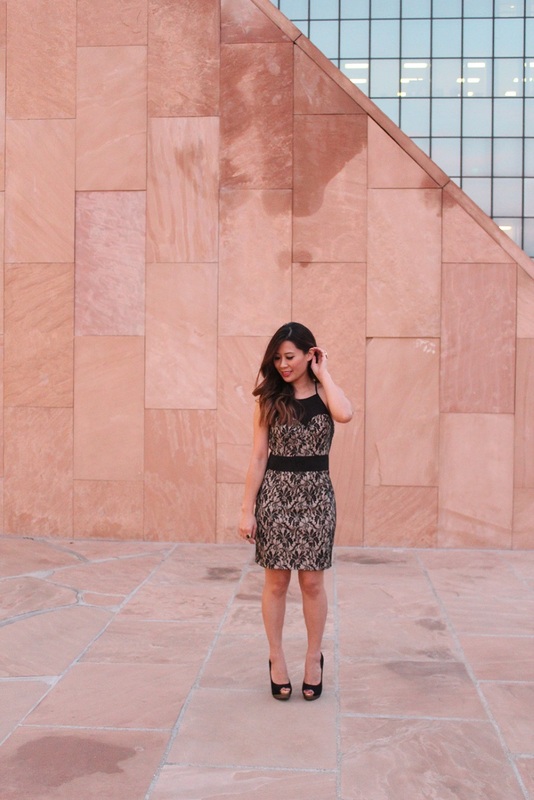 First up is a black lace dress that's perfect for work parties or a girls night out. Here I'm wearing the "Jessica" dress from my online shop dames&damsels (get 15% off your first order HERE). It's a fitted short dress with an elastic waistband and a black lace design. You can throw on a blazer or coat with some heels to be dressed in no time! Of course, I love being a girl and dressing up, so I paired it with black sparkle heels for a date night with Mr. T.
What do you like to do for date nights? My go-to's lately have been finding new places to eat, watching a movie, going to Disneyland, or even picking up food for a date night in (at home). No matter how busy we get, it's always important to have date nights! P.S. I'll also be hosting giveaways throughout the month so stay tuned! Check out Instagram (@kimberly_luu) for a giveaway with The Body Shop.